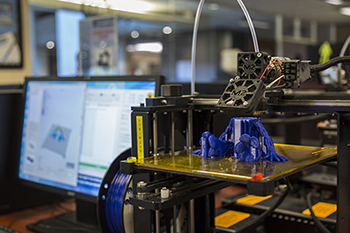 Create models, prototypes, mechanical fittings, art, and more with our 3D printers. Where? Have us print for you at the Technology Services desk on the 1st floor or do it yourself in the Makerspace on the 2nd floor. Who can use the printers? Students, faculty, and staff who would like to use the 3D printer must have a valid MTSU ID and an active profile in the Library check-out system. Academic projects get priority. What size can I print? Up to 6"x6"x6"
How much does it cost: $4.00 per hour; $2.00 per hour for academic projects. Minimum charge is $4.00. Small projects may take more than one hour and more complex jobs may take a few days. Consult with Tech Services staff on cost estimates for projects. Charges will be applied to the user's library account and must be paid online. * If your project is for academic purposes, a new design, or an upgrade to an existing design, you may apply for a free print job, awarded at the discretion of library administration. See details. How long does it take? Small projects may take more than one hour; complex jobs may take a few days. We will attempt to complete your job within 7 days. The print will be attempted at least 3 times before declared a fail. A Tech Services staff member will contact you when your job is completed. What colors can I use? Several color choices are available, but at this time, only one color may be used per model. Color swatches are available for viewing at the Tech Services desk. Where do I find models to print? We accept only .STL files, and files must be on a flash drive. Thingiverse is a great source for 3D models intended to be printed, or design your own models using any 3D modeling software such as 3D Studio, Blender, Solid Works, Tinkercad, AutoCAD, or Google Sketchup. As long as it can export the model to an .STL file, the printer can accept it. We do not edit your model except to downsize to the maximum size, and we do not clean your model after it is completed. What materials are used? The Library’s 3D printers use a plastic made from corn starch called Polylactic Acid or PLA for short. Because PLA is plant based, it will biodegrade over time when exposed to continuous moisture. You can view available colors on our display swatch ring. Contact: For more information, contact the Tech Services desk at 615-898-5666 or email Valerie Hackworth at valerie.hackworth@mtsu.edu. *Unpaid fees may result in a "hold" on the user's MTSU account, which may prevent class registration and other activities.